It never rains but it pours? After my (tweet's) stunning debut on CBC, I am now on Teacher's TV News. Ages ago I responded to a call for Classroom Correspondents, who would be available to talk about "burning issues". I thought it might be a bit of fun. 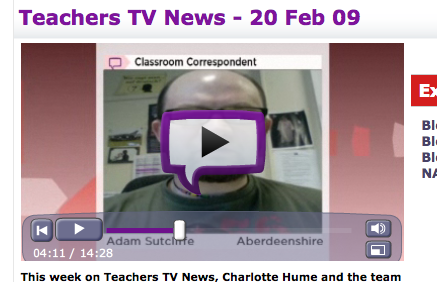 Anyway I was contacted yesterday to put together my thoughts on workload for this week's Teachers TV news. You can catch my thoughts starting at 4.05, but the whole piece is interesting. Some time earlier I responded to a Tweet from Alex Couros, who I follow on Twitter to so he could illustrate the worlwide networking nature of twitter. At the time I had no idea it was for a CBC (Canadian Broadcasting Corp.) interview. And here I am at 1.18 across Canada. Cool. This news story popped up in my Reader today and immediately grabbed my attention. The European Commission is facing a potential crisis due to a lack interpreters who are native speakers of English. Almost all meetings of the Commision require interpretation into English. If none are available meetings are cancelled. According to the Head of the Commission's interpreting unit, demand for native English interpreters is increasing, whilst CILT research has indicated and ever increasing shortage of skilled linguists across all sectors. HMMMMMMM! Why could this be? Could this be the result of ridiculous short sightedness of successive governments to promote the positive aspects of language learning. I think so. For too long schools have been allowed to demote languages from the core curriculum...mainly because they are perceived as difficult and therefore adversely skew results and therefore standings in utterly non-educationally sound league tables. Due to governmental policy and results based thinking at management levels a massive skills gap is opening up and there are no where near enough people to fill it. The English Government has put £8 million into a programme to increase take up of languages at university, but is this not too late. Youngsters need to have developed a liking for (or even have experienced) a language earlier in life. Hopefully then,there would be a real level of consistency of experience and the transition to secondary could be marked with a real step up showing evidence of serious progress, thus resulting in more quality lingusists on the scene...that's the theory anyway. Anyway here's an interesting video from the European Commission about interpreting. TGS Modern Languages Department German Vocabulary Guide Podcast No1 - "Hallo"! TGS Modern Languages Department French Vocabulary Guide Podcast No1 - "Bienvenue"
If you're a regular reader you might be experiencing a sense of déjà vu as you will have already seen this podcast...or have you. I looked at my first redux version (for 3 years) and decided it wasn't good enough. Not enough pictures and no noticeable slides to indicate a change of topic. So I changed it. You can watch it above or download any of the versions below, either way let me know what you think. A TGS Modern Languages Department French Vocablary Guide Podcast for S1. Never let it be said we passed up the oppotunity of a snow day to get out and enjoy it.